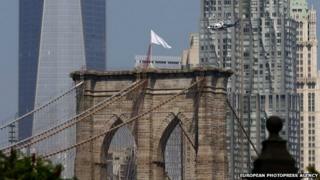 Authorities in New York are investigating who raised two large white flags on the towers of the Brooklyn Bridge early on Tuesday. The flags briefly flew atop two towers at either end of the landmark in the place of two American flags apparently removed by the perpetrators. As many as five people were caught on CCTV on the bridge in the minutes prior to the switch. Police officials said they would not treat the prank as a joke or statement. "We keep these things in perspective for what they are, but we also want to send a clear message that there will be an investigation," John Miller, deputy New York police commissioner for intelligence and counter-terrorism, told reporters. "They will be prosecuted. We don't take these things lightly or as a joke or as art, or within the realm of speech." He said the incident would be treated as trespassing that endangered the perpetrators and others. "I'm not particularly happy about the event," Commissioner William Bratton said. Mr Miller said security video showed four to five people crossing the bridge at 03:10 local time (07:10 GMT) on Tuesday. Around 03:30, a light illuminating the American flag on the Brooklyn side of the bridge appeared to go out. The same occurred on the Manhattan side of the bridge around 03:42. At 05:30, construction workers on the bridge noticed the American flags had been replaced with the white flags. Police officers trained to climb the bridge found two large flags - 20ft (6m) by 11ft - which appeared to be American flags with the red stripes and blue canton bleached white. Two aluminium pans were also found affixed as covers to the lights beneath each flag. There was a "good deal of pre-operational planning" involved, Mr Miller said of the incident, noting the complexity suggested the perpetrators had "experience climbing, in construction or bridgework". But, he added, the incident appeared to have "no practical nexus to terrorism or even politics". Authorities removed the white flags and are now searching social media for clues. More than 120,000 vehicles, 4,000 pedestrians and 3,100 bicyclists cross the Brooklyn Bridge every day, according to the New York Department of Transportation.